Distracted driving is the number one cause of accidents not only in New York City but all over the country. While distracted driving lead to an increase in fatal accidents nationally, in New York, it only lead to an increase in injuries. 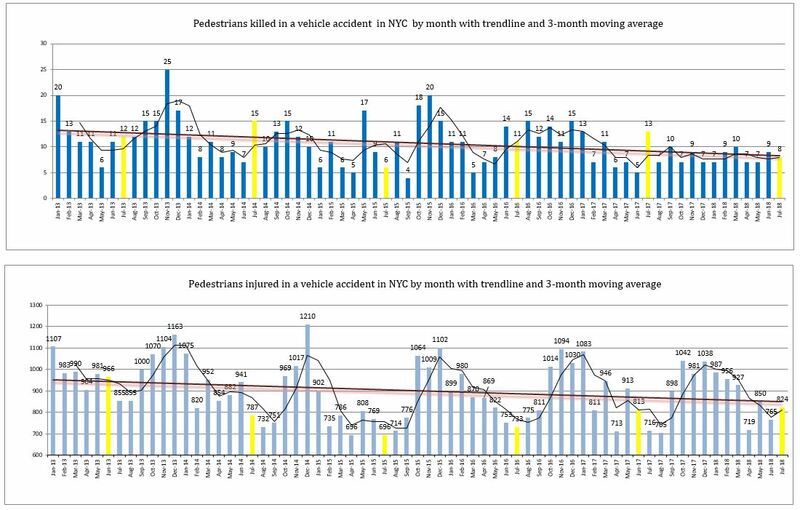 The multiple Vision Zero initiatives implemented in the city over the last 4 years to make the streets safer and reduce traffic deaths might be one of the factors contributing to this result. The road users category that recorded the most increase in injuries over the recent years are the drivers. Since the beginning of 2016, the monthly number of motorists injured in accidents is above 2,000 most of the time while before that, it was slightly above 1,000 with a few peaks over 1500. Last May, the number of motorists injured in the streets of New York reached a record number at 2534. This July it was slightly lower at 2,377 compared to respectively 2,322, 2,353, 2,073, 1,468 and 1,697 in 2017, 2016, 2015, 2014 and 2013. Pedestrians are the road users that benefited the most of the Vision Zero program. Pedestrians deaths and injuries are both on a declining trend. In July, 8 of them died and 824 of them were injured in traffic accidents in the city compared to 9 and 765 during the previous months and respectively 113 and 813 the same month a year ago. Since the 13 deaths recorded in July 2017 the monthly number of pedestrian deaths never went above 10 for the entire following year for the first time since Vision Zero was implemented in 2014. Pedestrian injuries which are usually lower during the summer than during the winter also followed a similar trend. Strongly promoted by Mayor de Blasio, bicycling took off in the city over the last few years with bike lanes expanding by nearly 330 miles over the last 5 years, including more than 68 miles of protected lanes, with a record 25 miles installed in 2017. There is still a lot to improve to make the city safe for bicyclists. It is still dangerous to bike in the city with constant construction work and various vehicles blocking the bike lanes and forcing cyclists to dangerously get in and out of motor vehicle traffic. However statistics show that the number of bicycle accidents recorded in July was the lowest number recorded for any months of July since Vision Zero started. 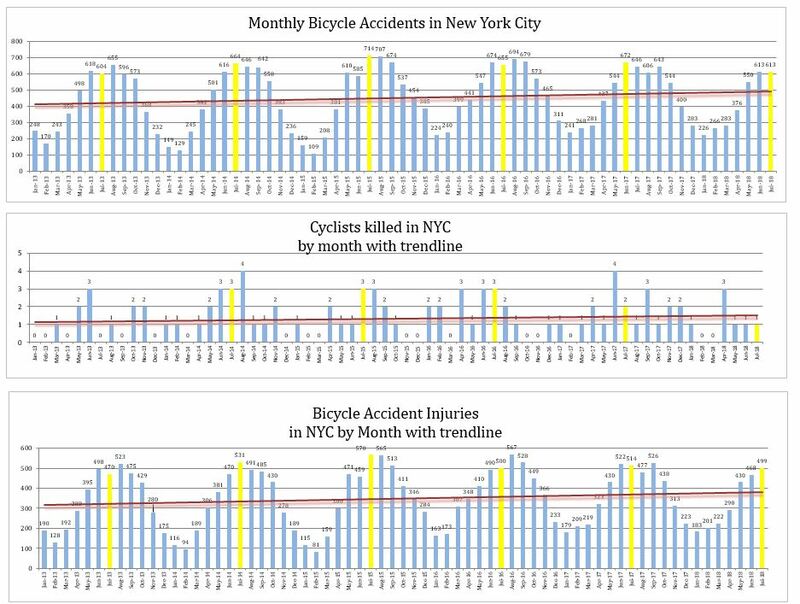 613 bicycle accidents were reported to the NYPD last July compared to 613 the previous month and respectively 672, 655, 714, 664 and 604 in July 2017, 2016, 2015, 2014 and 2013. The number of bicycle accident fatalities and injuries were also at a record low for the month of July with only one death and 499 injuries compared to respectively 2 and 514, 3 and 500 ,3 and 570, 3 and 531 and 0 and 470 in July 2017, 2016, 2015, 2014 and 2013. The global trend in NYC bicycle accidents deaths and injuries is still on the rise however it started to flatten over the last few months. Motorcycle accidents continue to rise and for obvious reasons the summer is when most accidents occur. Last July 317 motorcycle accidents were recorded in New York City compared to respectively 309, 316, 298, 283 and 251 in July 2017, 2016, 2015, 2014 and 2013. Bus accidents statistics in New York City are atypical. They seem to jump up and down depending on the months and it is not easy to understand what are the factors behind these numbers. July is generally a month during which the number of bus accidents are low. One reason behind it might be that the schools are closed and therefore there are less school buses in the streets. 547 bus accidents were recorded in the five boroughs of the city last July compared to 575 last June and respectively 558, 565, 552, 535 and 554 in July 2017, 2016, 2015, 2014 and 2013. This is the second lowest number of bus accidents recorded in July over the last 6 years. The lowest was in July 2014. Despite being consistently much higher over the last three years than what they used to be before that, truck accidents slightly decreased in July compared to the previous month and compared to the same month last year and the year before. 1,438 truck accidents occurred in New York in July 2018 compared to 1,645 in June 2018 and respectively 1,442, 1,618, 805, 684 and 620 in 2017, 2016, 2015, 2014 and 2013.